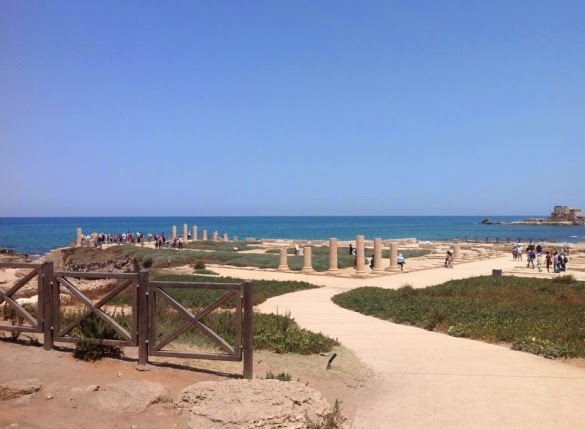 After we had been in Tel Aviv and a night, we drove the 60 or so km up to Caesarea from Tel Aviv. Driving is not that bad in Israel, the motorways are great. You just have to watch out that they have two lights, one for turning, and the other for going straight through. I nearly got us wiped out when the light went green, but not the one that mattered! Lesson learned! 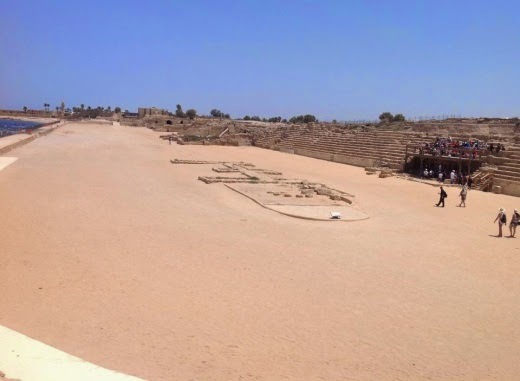 Anyway, it was great to drive the trip from Tel Aviv that Peter would have ridden on a horse with Cornelius’ men some 2000 years ago (Acts 10). 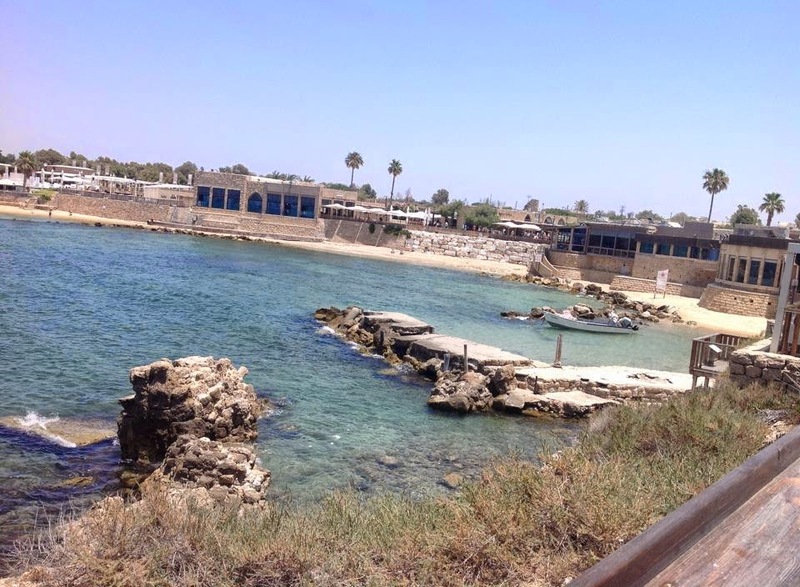 Caesarea Maritima is a great site! It has a fantastic theatre (see left). There is also a fantastic hippodrome (see right). We got our first sense on the trip thus far of the significance of Herod the Great (73-4 BC) to first century Israel. Herod's buildings are everywhere, e.g. the Second Temple (now destroyed), the Herodian, and the Synagogue in Hebron. Without exception, he was described positively by Israeli guides as a Roman and a Jew. In much biblical scholarship he is seen negatively, as a ruthless Idumean/Nabatean royal pretender despised by most of the people. He is also the one who chased Joseph, Mary, and Jesus out of Bethlehem and killed the young children in Bethlehem to try and destroy Jesus (Matt 2). The buildings were no doubt the product of a lot of slave labour as well. Whatever we say about him, he had a great vision for building and was a shrewd politician in his world dominated by Rome. 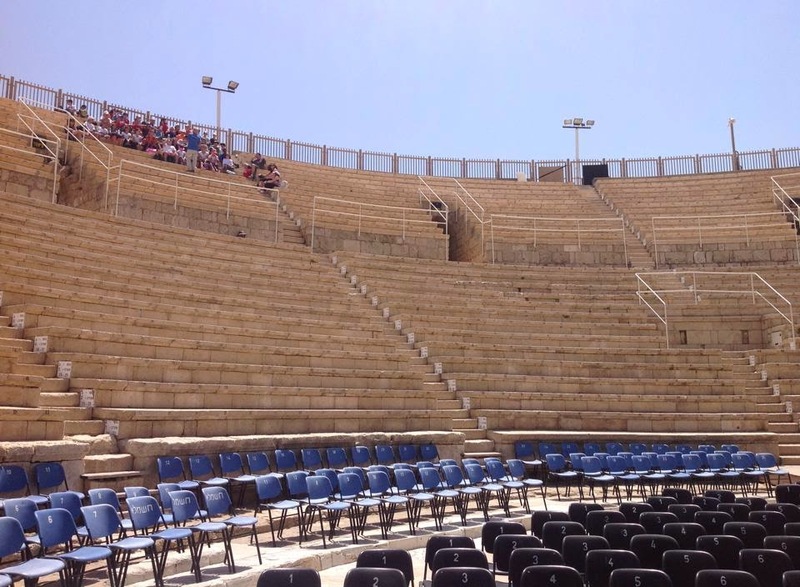 Herod had a palace by the waterfront between the theatre and hippodrome where Paul was likely tried, and perhaps was domiciled in the Praetorium (Acts 24-26). It was great to imagine Paul before Felix, Festus and Agrippa. On the right is the site of that palace. The harbour is also amazing (below), apparently the biggest human constructed one of the age. This of course is where Paul left for Roman jail accompanied by Luke and under the care of the Roman soldier Julius. The trip ended in ship wreck (Acts 27-28). I was surprised that there was no mention of Cornelius, Philip, or his prophetic daughters in any of the documents or signage (which was extensive). 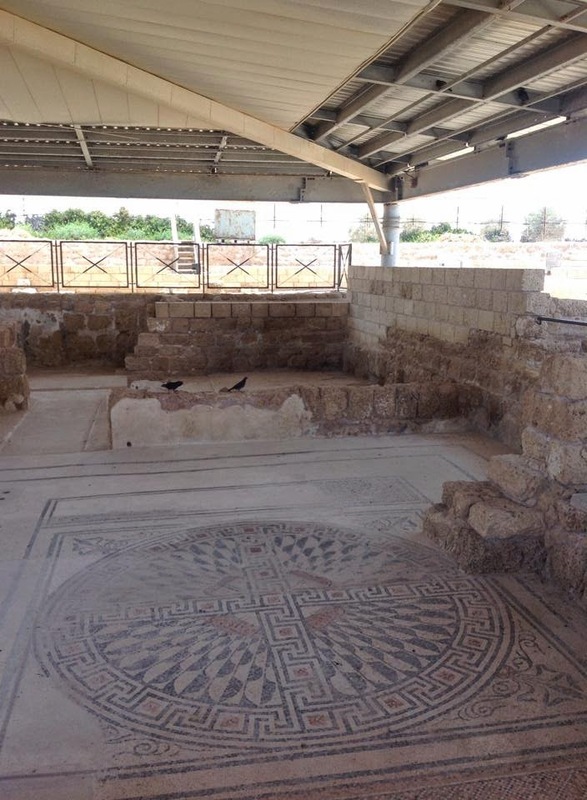 As one wandered the large site, one got a sense of Philip out and about sharing Christ in conversations at the baths and other contexts (bath below). Or, one could imagine his daughters sharing God's prophetic word in the gathered communities. The strategic importance to the Romans is clear. It is a great port into which Romans and produce could move to and fro east and west. It was their main base in Judea. From here they dominated the land and later launched their destruction of Israel after the Jewish rebellion. Like other sites on which there are no modern buildings, one gets a sense of the real story. It was a great morning of exploring.